In the Youth Zone | AwesomeNESS students recieve numerous awards! Today marks a special day when students recieve special honour awards for the 1st Semester. 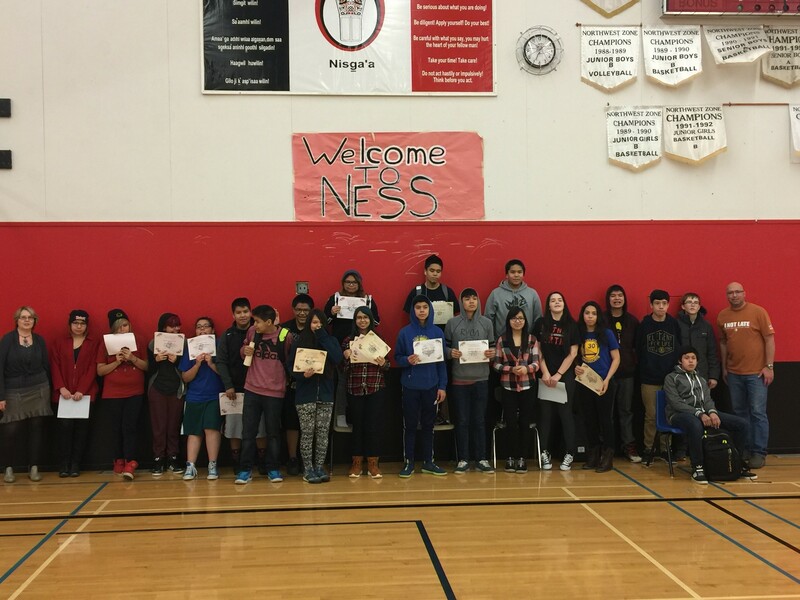 There were 70 awards handed out to students at the Nisga'a Elementry Secondary School. Keep up the great work! Forum is about one week that may very well change the rest of your life. It’s about giving smart and engaged 15 – 19 year olds a chance to experience Parliament Hill and supports them in using their voice. In Ottawa, on the Hill, with other equally dynamic youth. It’s about getting inside—deep inside—Canadian politics and public affairs and seeing what running the country looks like up close. It’s about learning how to collaborate and share ideas, then turn them into real community action. Beyond the history books, beyond the news channel and beyond classroom debates, there’s a lot to discuss. Your voice can make an impact now. Forum is also about inspiring youth to understand the dynamics and issues of their communities for three month before coming to Ottawa. For six months after their Ottawa experience youth are supported in having an impact and expanding their networks. If you have ideas, if you think, read and talk about what’s going on in the world. If you have something to say—say it at Forum. Be a Voice. Read further at the Forum website to see how you can participate! The BC Association of Aboriginal Friendship Centres (BCAAFC) currently has a Family Day photo/video contest, with a deadline of January 24 for submissions. It was a journey of a lifetime for two Nisga’a Youth that travelled to South Africa in early October. Brenna Doolan of Gingolx is Ksim Gisk’aast from Wilps W’ii Laxha and Leilani Wright of Gitlaxt’aamiks is Ksim Laxgibuu from Wilps Duuk’. Both currently reside in Terrace and ventured to Johannesburg, South Africa to participate in World Equip 2015. Kleanza Cathers competes in the Far Western Championships in San Jose California. Pictured is Kleanza in her 400 im at far westerns on her way to qualifying for canadian age group nationals in the event. Nisga’a Lisims Government is proud to have supported Kleanza Cathers from Gingolx to compete in the Far Western Championship swim meet in San Jose, California. There were 1,700 of some of the best swimmers in their respective age groups from across Canada, USA and Mexico in attendance. Kleanza, 13 years of age, competed extremely well in the 13–14 girls division. She swam to her personal best times, and attained two more tough national time standards for her age group, for a total of three personal best times. Kleanza is only the second swimmer from northwest BC to qualify in three swims for age group nationals. The Far Western Championship meet is consistently one of the fastest age group meets in the USA. In its tenth decade, the Far Western Championships saw Olympic and World Champions, including US Olympic Champion Michael Phelps, compete in it as age group swimmers. Her mother, Laverne Cathers (maiden name Smythe), provided us with a photo of Kleanza swimming in the 400 metre event on her way to qualifying for the Canadian age group nationals in the event. Laverne went on to state, “We just wanted to say a big thank you for your support of Kleanza…” Nisga’a Lisims Government provided a financial contribution to support Kleanza’s participation in the event from the Sports and Recreation fund, which is open to application from all Nisga’a citizens, particularly our youth, who are competing in sporting events. Our congratulations to Kleanza for achieving these amazing milestones. Si’aamhl wilin Kleanza – continue to swim well! On October 17, 2015, Billy Morrison of Laxgalts'ap BC won his fight 17 seconds into first round in Battlefield Fight League 39 (Halloween Hell). It was at Vancouver Hardrock Casino where many Battlefield fans came out to see the Event "Halloween Hell". Morrison came out holding his flag with pride as he took to the cage fearless, determined and ready for whatever they put in front of him. As in ready? Morrison trains 6 days a week 4 - 6 hours a day.